Workshops typically focus on a technique or skill (such as dovetailing or hand plane tuning and use) or on a specific project (such as a tool box, wall cabinet, or other piece of furniture). Classes usually include four to five people and so the instruction is personal and hands on. Each student works at their own cabinetmaker’s workbench. Students are encouraged to bring their own tools, but The Joiners Bench also provides tools to students when needed. Breakfast snacks, beverages and lunches are provided each day. The small numbers make the class satisfying and personal, but also require the commitment of students. All deposits are non-refundable. A good example of a Joiners Bench Workshop is the Enfield Shaker Cabinet. The cabinet construction involves a range of hand tool joinery. The case is built using dados and rabbets for joinery. The cabinet back is made from tongue and groove bead board planks, and the face frame and door employ mortise and tenon joinery. The cabinet’s cornice is shaped using traditional molding planes. The finish size is approximately 51 ¼ ” H x 22 ½” W x 14 ¼”. 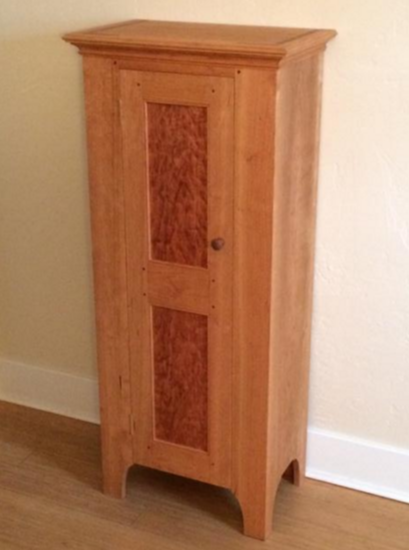 This beautiful piece of furniture is a pleasure to make and looks great in a home.